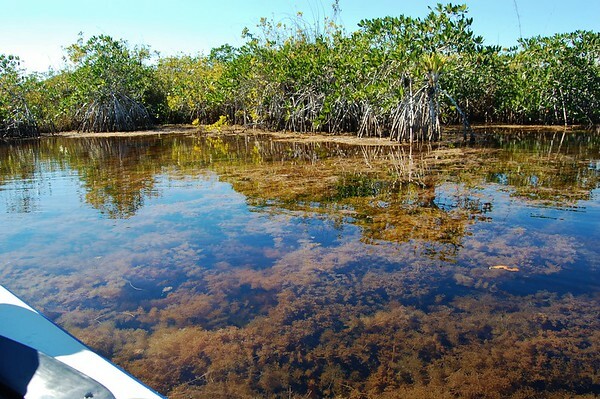 Our goal today was to do a paddling trip in the Flamingo area. 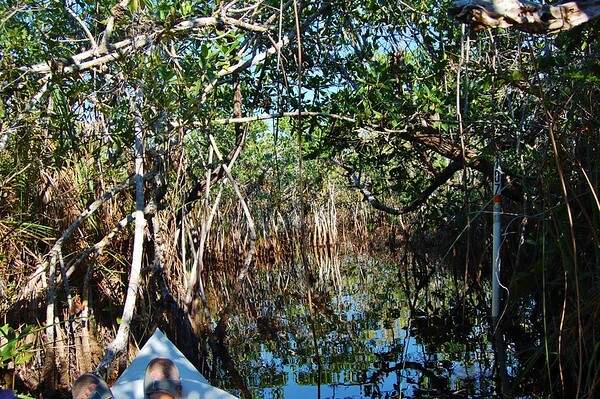 Due to high winds, we selected the short and sheltered Noble Hammock Canoe Trail. 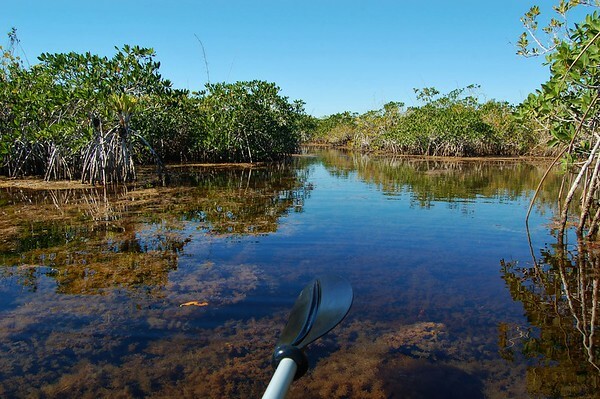 It was a great choice for this chilly but pretty day in Everglades National Park. 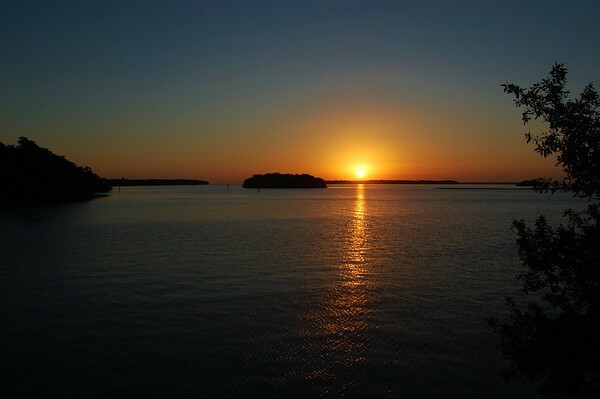 Once again, here at Flamingo in Everglades National Park, I got up early to watch the sunrise. Like yesterday morning, it was in the 50s and pretty chilly. Dolphins were once again feeding in the bay, but they weren't as close as yesterday. Rather than trying to get pictures, I just enjoyed watching them. They herded schools of fish and then picked them off as they jumped out of the water. Pelicans followed along taking advantage of the dolphins' efforts. I love watching nature in action. I took one last picture, before moving along. I stopped off at Eco Pond to see if there was anything interesting to photograph. 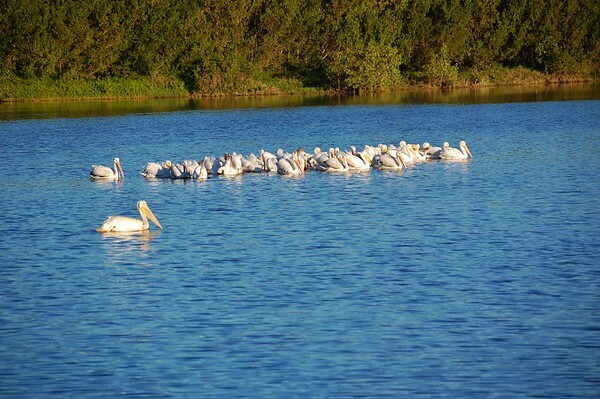 There was a flock of the huge White Pelicans. They feed by swimming in formation and then dipping all at the same time - quite a different method than their smaller, brown cousins. There were many of the "usual" birds, but no real good photo opportunities, so I headed on back to the campground. 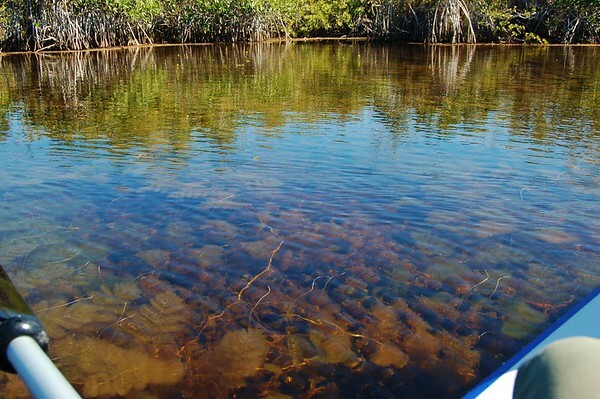 Today we headed out to paddle the Noble Hammock Canoe Trail. The launch is right on the main park road about nine miles from Flamingo. 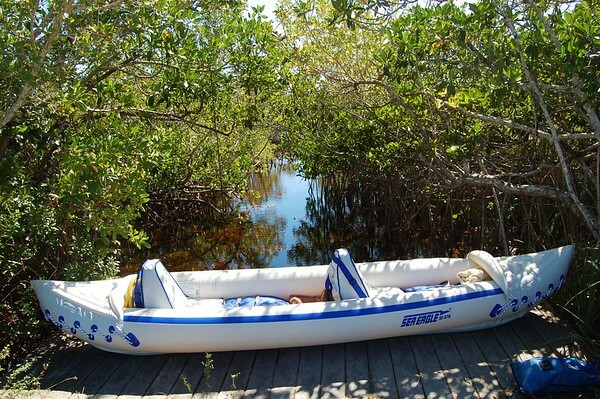 This is the shortest canoe trail in the Flamingo area, and it's also the most sheltered. So many of the trails go through open water, and that's no fun in the wind. 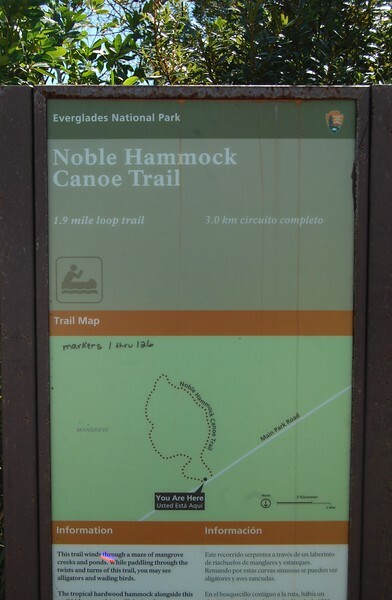 We considered doing the 5.5-mile loop of Nine Mile Pond, but it was just too windy, so we went with Noble Hammock at 2 miles. Now, just because it's short, doesn't mean it's fast. You'll see what I mean. I did my homework and knew that this was a shallow water trail. So, instead of taking our Sea Eagle FastTrack with its long skeg, we decided to go with our Sea Eagle 370, which is better for shallow water with its shorter skegs. Now, before I get an email from our friends, the Ryersons, at InflatableBoats4Less.com, I have to say that we just learned that there is now a "shallow water" skeg available for the FastTrack. We will be ordering one of those very soon. 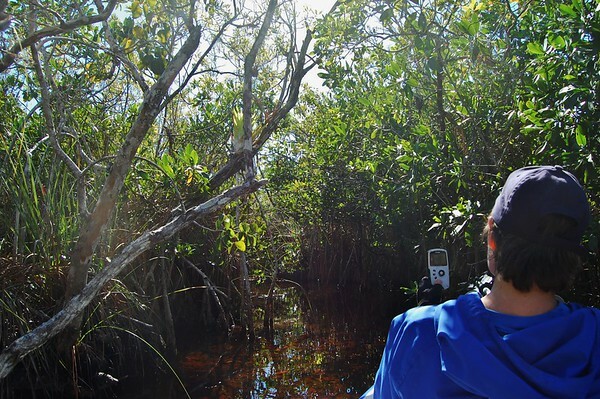 We got launched a little after noon, and headed out into the mangrove maze. 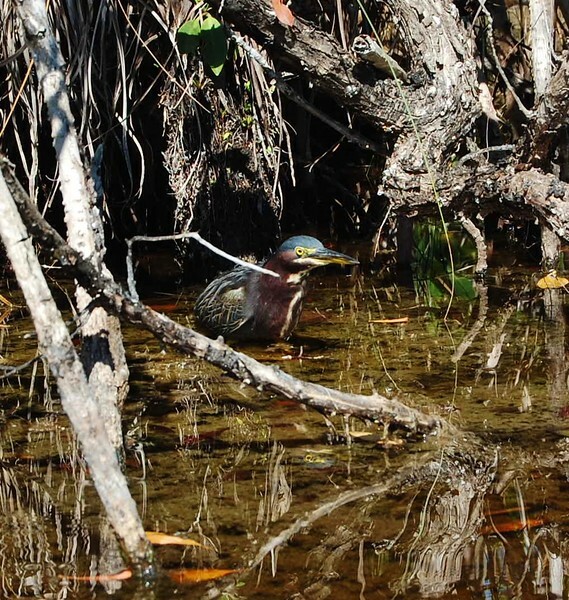 We spotted a beautiful little Green Heron right off the bat. 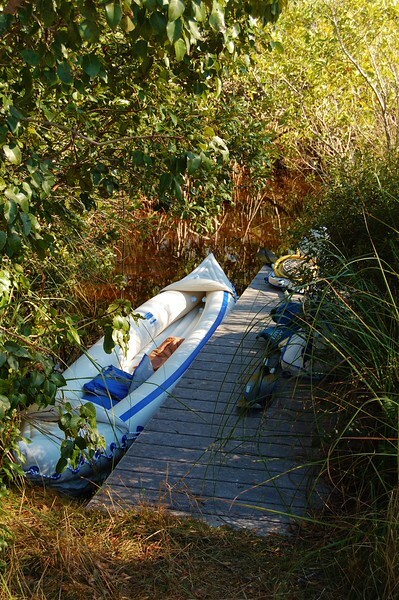 So, this canoe trail is narrow with so many twists and turns. 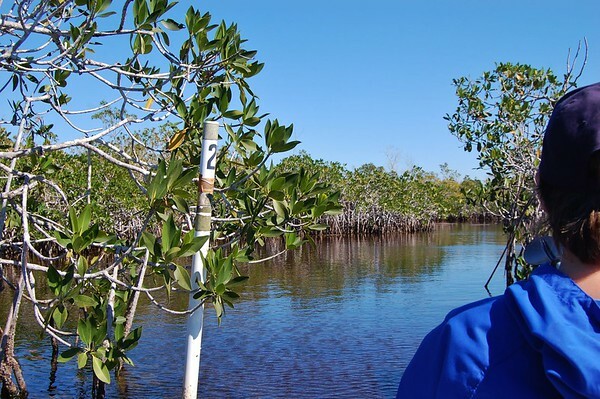 You have to follow the 124 navigation markers or you may never come back. 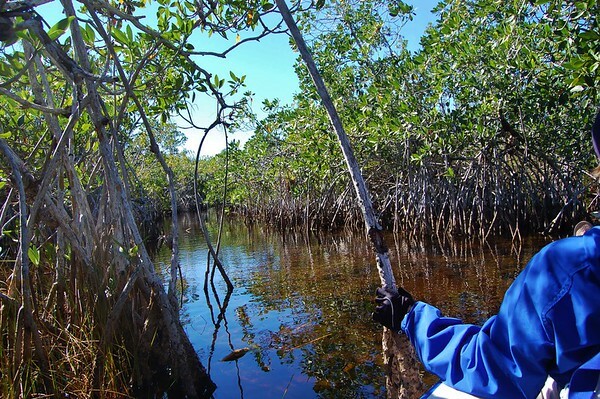 but there are several mangrove "tunnels" and places where we just had to pull our way through. Here's a little video of one tight section. 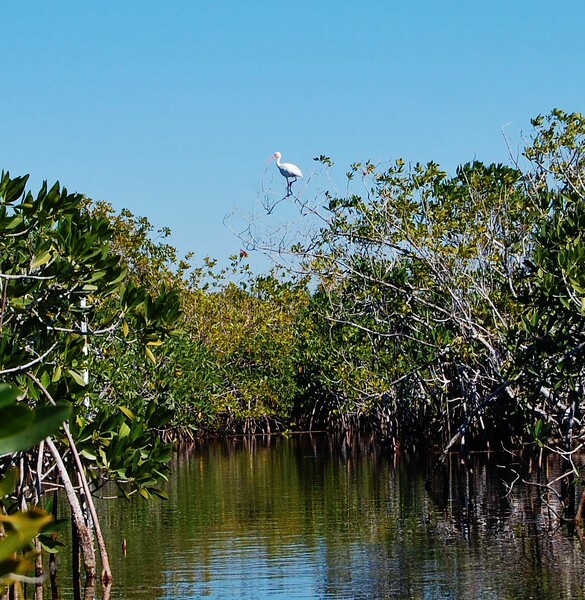 We saw a couple of White Ibis, but not much else in the way of bird life. We were supposed to take a hard right at marker 22, but straight ahead was a fairly large alligator, and we had to go check it out. 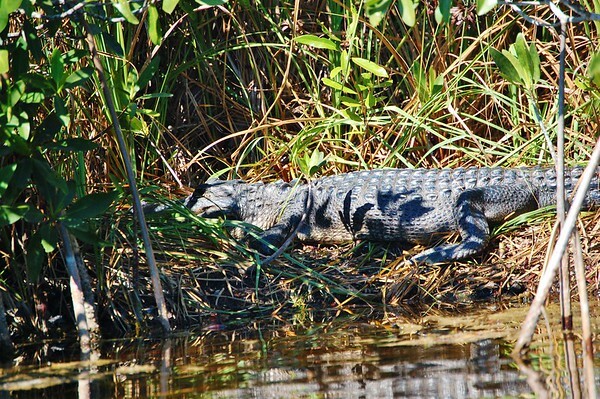 It probably wasn't a good thing to see such a large gator so early considering the very shallow water and close quarters. Linda was a bit concerned from that point on. 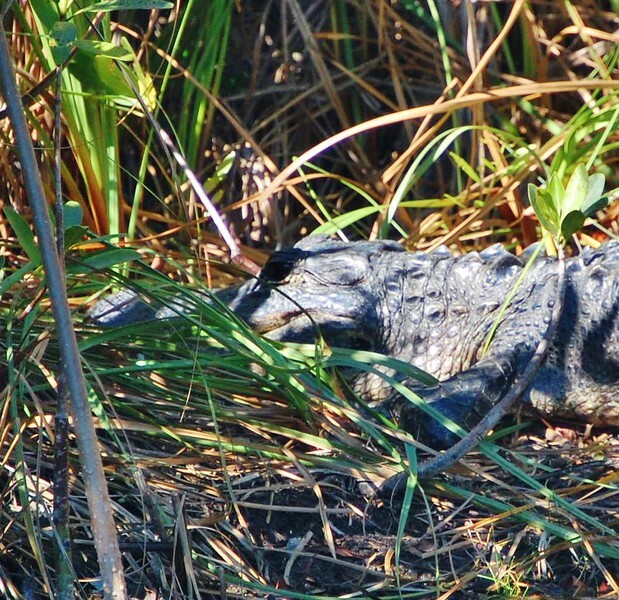 However, though we saw lots of places where alligators probably sun themselves, that was the only one we saw. 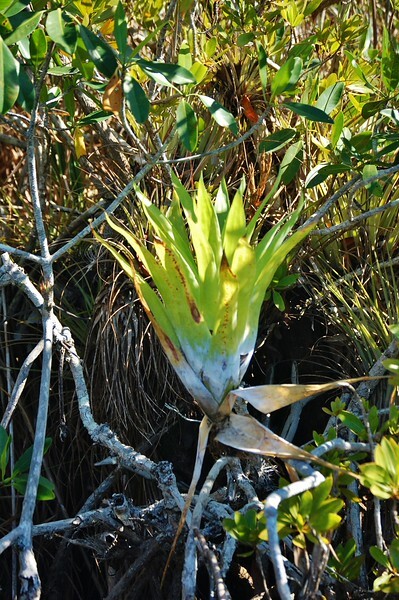 There were epiphytes everywhere, giving this paddle an even more jungle-like feel. Heading into a particularly narrow part. and we saw numerous gar, although we just never could quite a good picture of them. After marker 65, we stopped to have lunch in the boat. 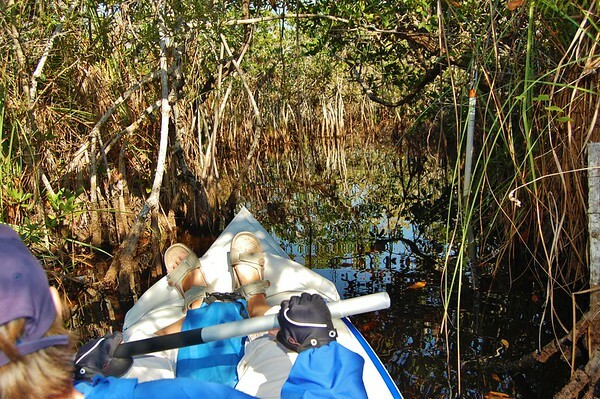 There's very little opportunity to get out of the boat on this trail, so we just hung ourselves up in some of the vegetation and enjoyed the quiet of our surroundings. As we got to marker 90, Linda broke her paddle down and used one end like a canoe paddle to help us get through the tunnels. I took about a three-minute video of her paddling us through this final narrow section. It's only a 2-mile trail, but it took us over three hours. It's definitely a great trail for a windy day, and we enjoyed it. But we were certainly ready to be finished at the end. The take-out, is about a tenth of a mile south of the put-in, and it's semi-hidden from the road. Linda went and got the Jeep, and then we took the boat out, cleaned it up, dried it off, deflated it, and loaded it up. We got back to our campsite around 4:00. 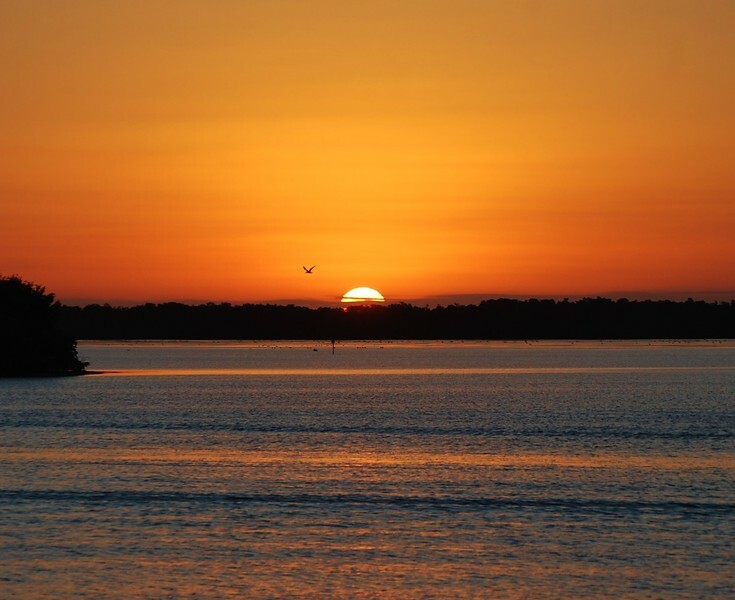 Though we're about as far south in Florida as you can get without being in the Keys, it barely reached 70 degrees today, our coolest day of the week. And with the wind, it felt much cooler. So, we were content to call it a day, and cozy up in our rig for the evening. Another great day at Flamingo.